Our Adoration Chapel is open continuously from Sunday at 6pm through Friday at 8am. If you’re not familiar with this incredible Catholic tradition, it is a practice in which the Blessed Sacrament is “adored” by the faithful. 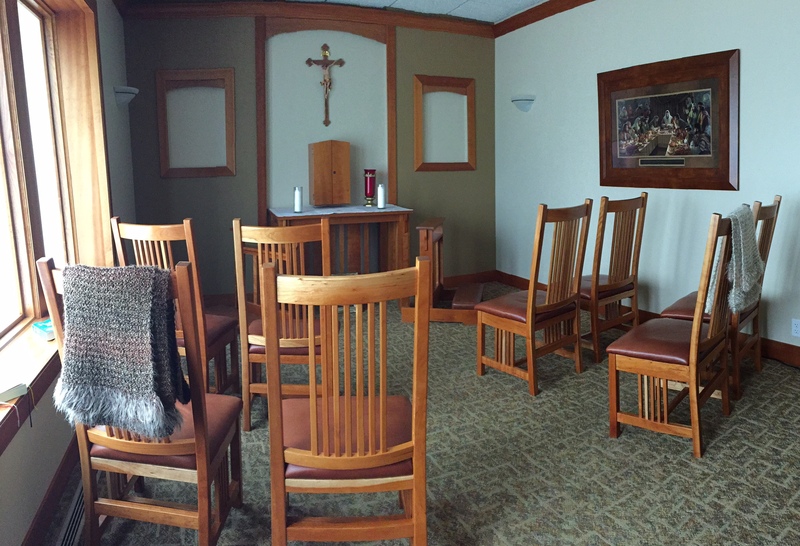 Parishioners sign up for their very own hour of adoration in our beautiful chapel located near the parish office. It’s quiet, private, peaceful and safe – all hours of the day and night. Consider spending your very own hour once a week with Jesus in the Blessed Sacrament. Facilitators: Manage scheduled hours & oversees the Chapel of Annunciation. Adorers: one hour per week with prayer partner. Sub List: be on call as a substitute. Visitors are always welcome to stop by, too. The Chapel has seating for 8, so come in for ten minutes if you would like. However, we encourage everyone to consider becoming a regular part of this ministry by committing to one hour each week to Eucharistic Adoration. We have nearly 200 people in this ministry that keep our chapel open for 110 hours out of 168 hours every week! But we can always use a few more Adorers to maintain a constant vigil of one or more adorers in the chapel every hour. If you can’t commit to an hour every week, consider being on the Sub list. The personal and communal fruits of Eucharistic Adoration are many. Focus on the Eucharist—on Christ—leads us to greater repentance and charity and a deeper desire for personal holiness, strengthens our bond to our local parish and the Church, has traditionally been linked to better service to the poor, and more recently has led to an increase in vocations to the priesthood and religious life. To sign up for your own Holy Hour, please call Jean Menge at 763.753.6064 or email at mengejean@yahoo.com. Adoration of the Blessed Sacrament outside of Mass goes back to the earliest days of the Christian Church (both Justin Martyr and Tertullian refer to it in writings). A “monstrance” is the beautiful gold vessel that houses the host. 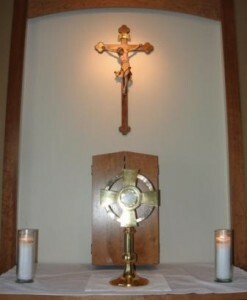 It sits on the small altar in our Adoration Chapel. A monstrance is also used for Benediction. When Eucharistic Adoration is opened continuously throughout the day and night, it is referred to as Perpetual Adoration. Prior to the 20th century, adoration took place primarily in monasteries and convents. St. Pope John Paul II often prayed for a perpetual adoration chapel in every parish around the world. Please fill out this form to contact this ministry with questions and comments. Fill out this form to signup to volunteer with this ministry. The ministry leader will get back to you as soon as possible with more information!